As mentioned in a previous post Are eCigs cheaper than Rolling Tobacco in the UK. I've been using Smoke Relief's products for over 6 months. In fact it was the first eCig I tried, so it's time to offer a full review. 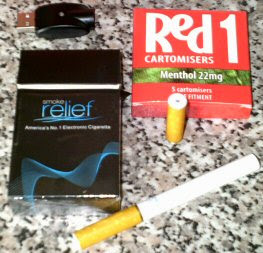 The design is a standard simulation of a cigarette, yellow cartridge, white battery and red LED. Every time I use this vendor deliveries have been made in 1 or 2 days. They have loads of Flavours to choose from (all good) and a decently high nicotine strength of 22mg. It's the cheapest starter kit I've found at £9.95 plus cashback and it's one of the best priced for cartridges. Starter Kit is £9.95 plus 17.17% cashback using TopCashBack*- COUPON CODE: STARTER. Tested, I effectively paid £8.59. 10 cartridges for £11.90 + 17.17% cashback - COUPON CODE: FREESHIP10. For maximum cost saving use a cashback site then copy and paste relevant coupon. For people new to cashback this may be daunting and confusing so follow theses easy steps. Sign up for a TopCashBack* account. Once logged in search for Smoke Relief. Open Smoke Relief website using link on TopCashBack. Make your purchase as usual, remember to use Coupon code before finishing. I'm going to rate this 9 out of 10 for being of outstanding value and quality. Ideal for first time vapers and long termers alike. Battery and Cartridges are interchangeable with Freedom, iCig, Nicolites and Skycig. I as a dentist totally recommend this electronic cigarettes, they have too many benefits. Your teeth won't get yellow because of tobacco. Your lungs will be safe. In my opinion, electronic cigarettes are the future.